• “Mini Juggernaut”! Yes, that’s right. 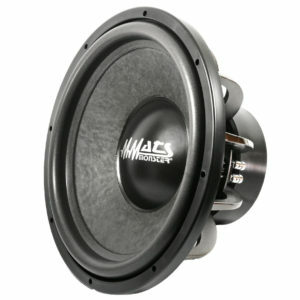 You want to come close to hanging with the Big Guys’, this is the car subwoofer to do it with without breaking the bank. • From its 140 ounce double Y-30 magnet assembly to its Kevlar impregnated conebody, this subwoofer has what it takes to make an impression. • Other features include: 3” Dual 2-ohm Copper wire and Aluminum Voice Coil, Dual 8” flat Nomex Spider, radius vented back-plate for direct voice coil cooling and spring-loaded connectors round out this beast. • Available in 10”, 12” and 15” models. Throw them 1000 watts of power and hold on! The Monster series subwoofers will get you to within 3db of our Juggernaut series subs. Features the same built in our Juptier Florida USA engineering as the Jugg’s but at a lower price point and half the power handling capability. 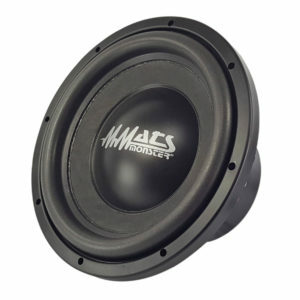 Don’t be mistaken though, despite a lower power rating than the Juggernaut’s these woofers will pound your car with incredibly deep, super powerful and satisfying bass. 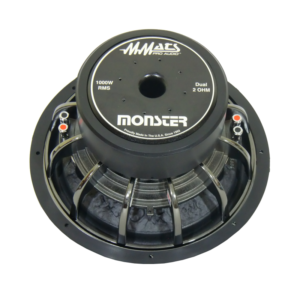 Stop by your local MMATS dealer today and experience the power of Monster subwoofers. View cart “Monster15” has been added to your cart.